A colourful alternative to Christmas Turkey this marinated rib of beef is served with baby Yorkshire puddings filled with Mediterranean vegetables and garlic mashed potato with beef gravy. Mix together the yogurt, 3 cloves of garlic and the mustard. Add the beef, cover and marinate overnight in a refrigerator. Place the beef on a rack over a roasting tin in a preheated oven 220ºC, gas mark 7 for 45-60 minutes. Heat 2tbsp oil in a frying pan, add the onions, peppers and the remaining garlic, and cook for 4-5 minutes. Add the spices, the tomato purée and 150ml water. Bring to the boil and simmer for 5 minutes. Pour into a bowl and set aside. Wipe out the pan. Heat 3tbsp oil, fry the aubergine until golden brown. Add the onion mixture, stir well and sprinkle with the parsley. Place the cherry tomatoes in a shallow roasting tin with the remaining oil and balsamic vinegar. Place in the oven for the last 20 minutes. Remove the beef from the oven and stand for 10-15 minutes. Fill each pudding with the aubergine mixture and place on a baking tray in the oven for 5 minutes. Make the gravy using the pan juices thickened with cornflour then add the beef stock to the required consistency. 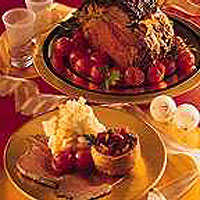 Slice the beef and serve with the filled puddings, cherry tomatoes and beef gravy.